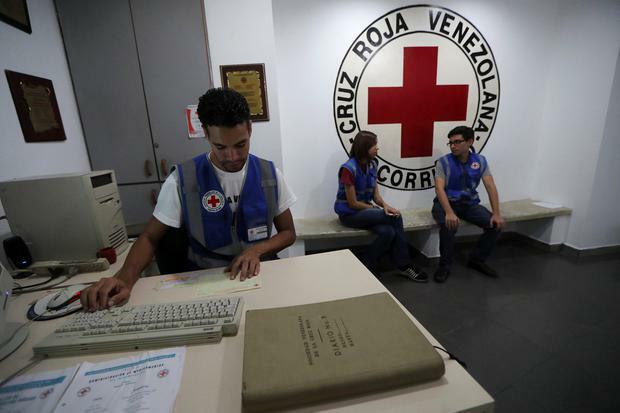 The Red Cross said yesterday it was prepared to channel humanitarian aid to Venezuela through an operation that could be similar to one in Syria, potentially helping ease chronic hunger and disease in the South American nation. President Nicolás Maduro in February blocked efforts by political opponents to bring US-backed aid into the country across its borders with neighbouring Colombia and Brazil, and has for years denied the country was suffering a humanitarian crisis. The involvement of the International Federation of the Red Cross and Red Crescent (IFRC) could signal that Mr Maduro’s socialist government, which has been subjected to crippling US sanctions, may allow in much-needed food and medicine. Dozens of nations have recognised Juan Guaidó, the head of Venezuela’s National Assembly, as the country’s rightful leader, arguing Mr Maduro’s 2018 re-election was illegitimate. Mr Guaidó, who invoked the constitution to assume an interim presidency in January, led an unsuccessful effort to transport humanitarian aid into Venezuela from neighbouring Colombia and Brazil on February 23. The IFRC “can count on the legal and technical conditions to work in the country, to gain access to humanitarian aid that is so needed,” the group’s president Francesco Rocca told a press conference. The group could begin providing assistance within 15 days, and expects that it will initially be able to help 650,000 of the most needy citizens in the country of around 30 million inhabitants, he said.